The New Testament notices things which from our standards do not seem to count. 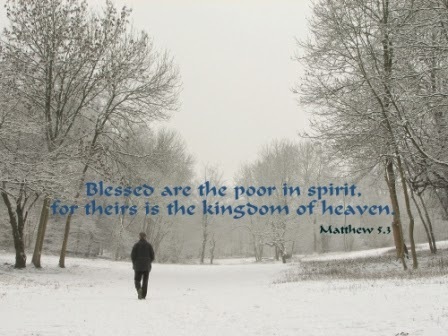 “Blessed are the poor in spirit.” literally – Blessed are the paupers – an exceedingly commonplace thing! The phrase we hear so often, Decide for Christ, is an emphasis on something our Lord never trusted. He never asks us to decide for Him, but to yield to Him – a very different thing. At the basis of Jesus Christ's Kingdom is the unaffected loveliness of the commonplace. The thing I am blessed in is my poverty. If I know I have no strength of will, no nobility of disposition, then Jesus says – Blessed are you, because it is through this poverty that I enter His Kingdom. I cannot enter His Kingdom as a good man or woman, I can only enter it as a complete pauper. The True character of the loveliness that tells for God is always unconscious. Conscious influence is priggish and un-Christian. If I say – I wonder if I am of any use – I instantly lose the bloom of the touch of the Lord. “He that believeth in me, out of him shall flow rivers of living water.” If I examine the outflow, I lose the touch of the Lord. Which are the people who have influenced us most? Not the ones who thought they did, but those who had not the remotest notion that they were influencing us. In the Christian life the implicit is never conscious, if it is conscious it ceases to have this unaffected loveliness which is the characteristic of the touch of Jesus. We always know when Jesus is at work because He produces in the commonplace something that is inspiring.